RESERVATIONS ARE TO BE MADE EXCLUSIVELY BY PHONE OR E-MAIL. 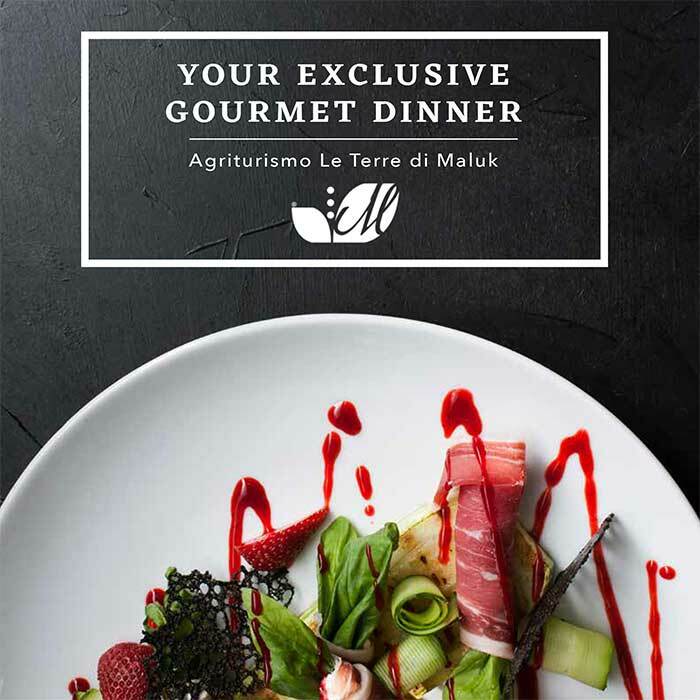 Starting from 2019 Le Terre di Maluk also means Sea Food; it will be possible to book some delicious fish based menus relying on the freshness of the local fish and the uniqueness of the Stoccafisso all’anconetana. Fish dinner can only be booked on Friday evening. Reservations are for full menus (at least two main courses) and for a minimum of 15 seats (a maximum of 2 groups of 30/40 people are accepted). The menu must be agreed with at least a week’s notice in order to guarantee the quality and freshness of the raw material. Tradition is linked to innovative menus that bring out the true flavors of the Marche region: strictly hand-made pasta, zero-km meat, our fields vegetables and gorgeous desserts created by the pastry chef Alice in the technological laboratory inside the country house. Meat dinner can be booked from Monday to Friday and on Sundays. Reservations are for full menus (at least two main courses) and for a minimum of 15 seats (we accept a maximum of 2 groups of 30/40 people are accepted).